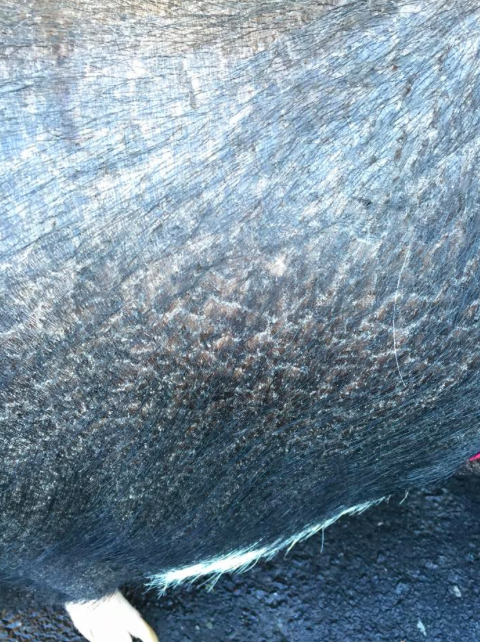 Healthy skin and hooves depend on a healthy environment, proper skin care, and proper diet. Pigs have a naturally dry skin, very few sweat glands, coats that will blow causing them to go bald overnight, and productive oil glands and scent glands. Diet and appropriate hydration are probably the most important factors in keeping skin healthy. Some pigs need supplements in order to develop healthy skin and hooves. 1. Vitamin D3. Healthy pigs will get enough vitamin D3 if they have 15 minutes of sunlight per day. Sunlight filtered through window glass will not provide the correct wavelengths of light to allow the pig’s body to produce vitamin D. Healthy thickened skin (a condition called lichenification) will not absorb and utilize sunlight correctly, so oral supplementation is required. Vitamin D3 capsules (1000 – 2000iu) can be given once a day for 2 weeks , then once weekly. All indoor pigs should have vitaminD supplementation. A full spectrum light, marketed for people with Seasonal Affective Disorder (SAD) can be used for 15 minutes per day if you would prefer to avoid supplements AND if you pig already has healthy skin. 2. B-Vitamins (especially biotin), trace vitamins and trace minerals – here are 30 or so trace vitamins and minerals that are necessary for healthy skin. B vitamins, especially biotin, are also very important. Fortunately, there are several horse products that have been formulated for healthy skin and hooves that work very well for pigs. They are formulated in a pelleted feed form and can be obtained at the local feed store. Farnam’s horseshoer’s secret is an excellent product for this, but there are several that would work. 1 teaspoonful per day for 2 weeks, then once a week for a long time. 4. Vitamin C – vitamin C is needed for healthy metabolism and absorption of other vitamins and minerals. Vitamin C, 500mg oncea day for 2 weeks, then once a week. 5. Vitamin E 400 iu once a day for all pigs – helps with the balance of selenium and magnesium in the body. 6. A diet with lots of fresh greens, limited fruits,and a balanced pelleted or homemade diet is essential. 7. A selenium/vit e/magnesium product is also a good idea, especially in areas of the country where the soil is poor in selenium (like the pacific northwest). A horse feed-through product works very well, 1 (one) teaspoonful once a week. Available at the feed store. Pigs will root and scratch on anything and everything. We must make sure that they have a safe environment – no wires, glass, poisonous plants and that sort of thing. 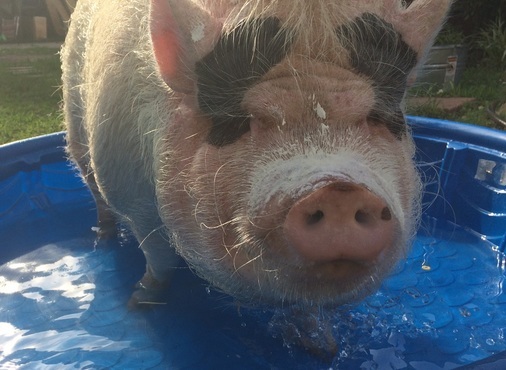 In addition, they must be provided with shade (sunburn is very common in pigs), water and mud (to help keep bugs, stickers, and sun away, and to help them stay cool), and graze for rooting andeating. Sunburn is very common in pigs. Some plants, medications and illnesses will cause photosensitivity, which will cause the sunburn to be much worse, or will cause a pig to burn even in the shade. If your pig is on medication (other than the dietary supplements, and de-wormers), keep it inside until it has been off of the medication for 2 weeks. If your pigis sick, keep inside until it feels better. Sunscreen is useful in preventing sunburn. Use a children’s sunscreen with the highest spf that you can find –and apply it frequently (every 30 minutes is recommended). Make sure that your pig has shade and mud to roll in – this is a great natural sunscreen. Or – only allow your pig outside for a limited amount of time early in the morning, or at dusk. 1. 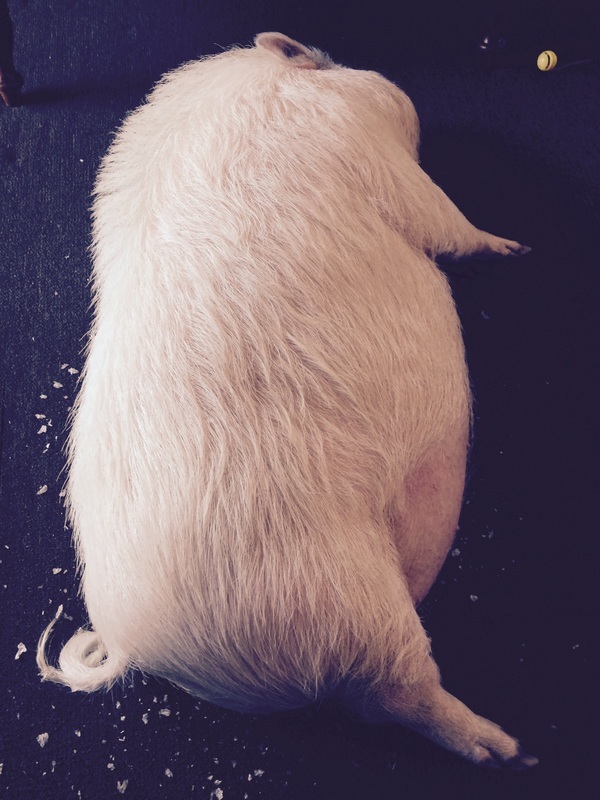 Bathing – house pigs need to be bathed and most love it. It is important to use a gentle soap and to rinse completely. Do not overbathe—it can strip the natural oils out of the skin and cause dryness. Brushing and forking is always good. 2. Oils – there are several good quality moisturizers that can be used to soften a pigs skin. Try some on a small area of skin first to make sure that there is no allergic reaction. Coconut oil can be used as a lotion. Extra Virgin Olive oil is also a great way to moisturize the skin, however, after application, you MUST use sunblock as well so the skin doesn't burn. Sometimes it looks like we are trying to help prepare a forensics class for collection of DNA evidence. In this case, I knew there was some dry skin and was "forking" to help eliminate it. Outside, this wouldn't be so obvious. I get asked at least 4 times a day what can be done about the dry skin. Many things can be done, but its more of a routine change than one single treatment that will fix the problem. Using a rubber or very soft bristled hairbrush (and we suggest doing this OUTSIDE) you can help facilitate the removal of dry/dead skin by brushing your pig at least 2-3 times a week, they would prefer you do this everyday, of course. Be sure your pig has been treated for parasites, that is one of the many reasons why pigs may have dry, flaky skin. Click here to learn about parasite control. Always use sunblock, especially on the lighter pigmented skin pigs, the suns harmful rays are harmful for pigs just like they are for humans and pigs skin is at risk for developing skin cancer as well. Some skin disorders are a result of a vitamin deficiency and a supplement needs to be added to the diet to make up for whatever is lacking. You can give too much supplements and vitamins, so I wouldn't recommend adding anything without your vets approval first. Click here to read more about vitamin/nutritional deficiencies and determine if you need to mention this the next time your pig is seen. Biotin is commonly used to improve skin health as is fish oil and Vitamin E.
There are things you can do to improve the dry skin. Do not bathe your pig often, this strips the natural oils and can actually worsen the situation. Do use coconut oil. You can freeze it and give with meals, you can give a teaspoon with food, you can give with a treat or you can apply directly to the skin. You can use lotion. I suggest using the most natural, non perfumed or non-cosmetic type you can find so the likelihood of developing any type of contact dermatitis is lessened. Extra virgin olive oil: You can apply extra virgin olive oil directly to your skin as a moisturizer. Olive oil's chemical distribution is similar to the skin's own natural oil, or sebum; it softens and smoothes your skin, leaving it supple while locking in moisture. In addition, olive oil is high in antioxidants and can stimulate the production of collagen and elastin. For an olive oil emulsion, mix equal parts oil and water with a hand-held frother, or apply oil to skin while still moist. You MUST use sunscreen when using oils of any kind so the harmful rays of the sun aren't accelerated into horrible sunburns for pigs. The use of sunscreen on a pig is recommended regardless of skin type. You can also use a rubber fingered brush to help rid the body of dry flaky skin. (You will want to do this outside) Pigs are not immune to developing skin cancer (melanoma) or getting sunburn. Sunburns can be mild to severe, same as humans. Some pigs have more sensitive skin than others and will turn red at the slightest touch. Coconut oil has the fats that can help dry skin, but brewer's yeast, known as nutritional yeast grown on sugar beets has the amino acids that help tremendously. You can also give both if you need to. An example of the brewers yeast can be found on Amazon by clicking here. http://www.amazon.com/Solgar-Brewers-Yeast-14-powder or this one, which is a different brand. http://www.amazon.com/Brewers-Yeast-Flakes. Tractor supply sells a swine conditioner as well that is safe to use on your piggy. You can use olive oil applied directly to the skin, but this is not suggested if the sun is bright and could potentially lead to sunburn unless you use a sunblock as well.